Hello there, and welcome back to our blog! Here at Balboa Victory Dental, we want to make sure that people understand the risks of home whitening products. If you visit your local drug store, you will most likely be able to find multiple options for home teeth whitening, options that promise to make your teeth shades lighter in as little as few treatments. What’s more, these treatments claim to be easy to use and do their best to convey the message that they will not hurt or damage your teeth. Unfortunately, these promised results are not always the results that are delivered to the consumer. In today’s post, we wanted to go over a few reasons that we feel you should only trust your teeth whitening needs to your dentist and avoid those over-the-counter products at all costs. Continue reading below to learn more. Whitening treatments that are purchased at the drugstore, for the most part, come in a one size fits all packaging. 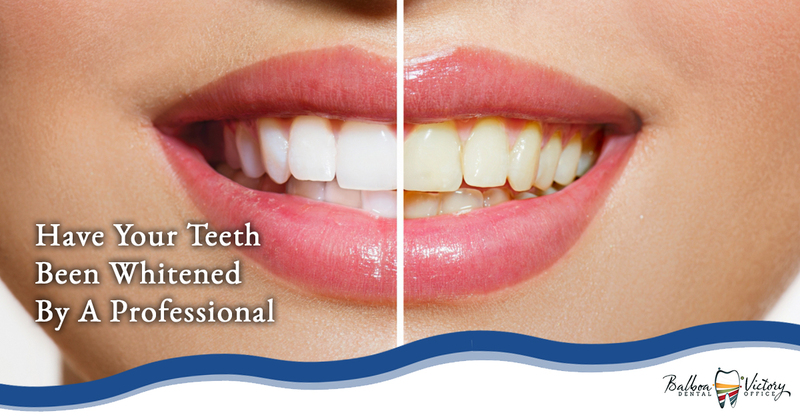 These treatments are produced in order to be able to appeal to a wide range of customers and to help as many people as possible achieve whiter teeth. While this is good in theory, in practice the results can be less than stellar for the people who choose to use these treatments. While the trays or strips that are sold in stores may have amazing results for certain people, they may be completely ineffective for someone else. Below, we have listed a few more reasons why you should only trust your teeth whitening needs to a professional. Professional Strength: While many over the counter teeth whitening options claim to be just as strong as the whitening services provided by professionals, they simply aren’t. The vast majority of whitening products sold in stores only contain a small amount of peroxide whitening agent, usually around three percent. This may be enough for people who have slight staining of their teeth, however, for people who suffer from severe of intrinsic stains, this level of whitening agent is barely enough to scratch the surface. When you visit a dentist for your teeth whitening needs, the products they use will have up to 35 percent peroxide present. This means that this gel is strong enough to penetrate the enamel of your teeth, providing a deeper whitening that can whiten your teeth up to ten shades in a single visit. Comfort: It’s common knowledge that home teeth whitening products can cause discomfort if people are not careful. Leaving teeth whitening solutions on the teeth for too long, or overusing teeth whitening agents can cause teeth to become overly sensitive and, in some cases, can even affect the integrity of tooth enamel. Additionally, damage can be done to the gums and teeth if the whitening agents are exposed to areas of the mouth that they are not supposed to be exposed to. When you visit a dentist to have your teeth whitened, you can rest assured that the dentist will take every precaution necessary to ensure that your teeth and gums are as well protected as possible from damage as a result of the teeth whitening treatment. Custom: As we stated before, most take-home teeth whitening treatments are designed to appeal to as wide a range of people as possible. This means that the level to which a person is able to “dial in” the treatment in order to provide the best result for their individual needs is severely hampered. When you visit a dentist, like us here at Balboa Victory Dental, they will take the time to make sure that your teeth whitening treatment is tailored to your specific needs. Because dentists have access to professional quality teeth whitening agents, they can better determine how much peroxide is needed to achieve your desired look and then mix the whitening gel to the appropriate strength level. This means that even if you don’t want your teeth to be as white as a piece of paper, you can still visit your dentist to lighten your teeth to your desired level. Joins us again next time as we continue to cover some of the benefits that come along with seeking the help of a dentist for teeth whitening services. If you would like to learn more about our teeth whitening options or you would simply like to learn more about what we offer at Balboa Victory Dental, please contact us today by filling out our contact form or giving us a call. We are an Encino dentist office dedicated to making sure that all of our patients receive the best care possible. Don’t settle for second best when it comes to the health of your mouth, contact us today and let us show you why we are a Top Rated Local ® dentist.